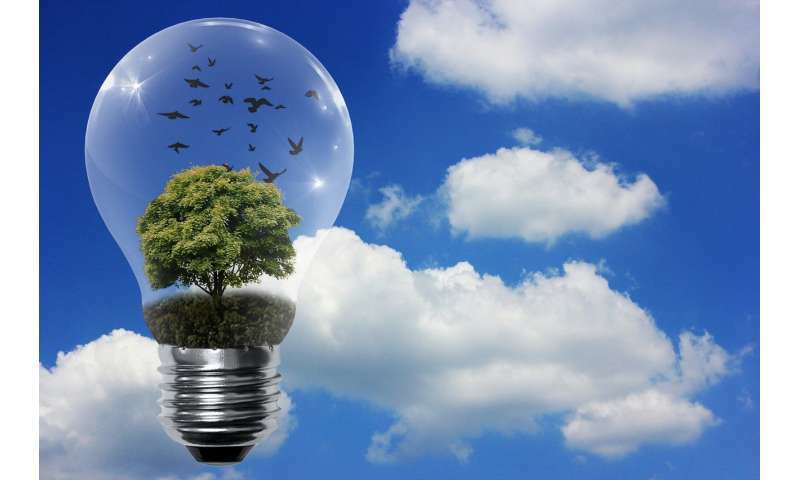 (Tech Xplore)—Conclusions that we can reach a stage where renewable electricity runs the world may not sit easily with skeptics but a study contends that it is feasible by 2050. Climate News Network said the researchers believe 100% renewable electricity is attainable by mid-century, or even earlier. The study is titled "Global Energy System based on 100% Renewable Energy – Power Sector" The study was carried out by Finland's Lappeenranta University of Technology (LUT) and the Energy Watch Group (EWG). The Energy Watch Group (EWG) is described as "an independent, non-profit global network of scientists and parliamentarians." The study was presented earlier this month during a renewable energy showcase event on the sidelines of the United Nations Climate Change Conference COP23 in Bonn. The authors spelled out the extent to which they say this is feasible: A global electricity system fully based on renewable energy is feasible at every hour throughout the year. It is said to be more cost effective than the existing system, largely based on fossil fuels and nuclear energy. "There is no reason to invest one more dollar in fossil or nuclear power production," said EWG president Hans-Josef Fell." The study pointed out benefits accompanying such a transition to renewables—bringing greenhouse gas emissions in the electricity sector down to zero and reducing total losses in power generation. It would create 36 million jobs by 2050, 17 million more than the sector has today. Total levelized cost of electricity (LCOE) on a global average for 100% renewable electricity in 2050 is given as €52/MWh (including curtailment, storage and some grid costs), compared to €70/MWh in 2015. Their model, said Alex Kirby in Climate News Network, "simulates the most efficient energy supply with an optimal mix of technologies and locally available renewable resources." In sum, the transition would be driven by solar PV and battery storage, with solar PV accounting for 69% of the total 2050 energy mix followed by wind with 18%, hydropower with 8%, and bioenergy with 2%, according to the study. As for batteries, they were said to be the key supporting technology for solar PV. "The storage output covers 31% of the total demand in 2050, 95% of which is covered by batteries alone." Kirby quoted Christian Breyer, lead author of the study and professor of solar economy at LUT. "A full decarbonisation of the electricity system by 2050 is possible for lower system cost than today, based on available technology. Energy transition is no longer a question of technical feasibility or economic viability, but of political will," Breyer said. Before anyone posts something saying this is biased and will never work, can you please provide proof of our own position that doesn't come from oil company think tanks? Bahamas, Virgin Islands and Puerto Rico are nearby; Under-Ocean Hyperloops for Cargo/People Transport, Also for Discharged & Charged Battery Transport from Overlaid Solar Panels ! Don't Forget that 3/4 Area of the Planet is filled with Sea Water. (And Planes Flying over the area can drop the discharged Batteries there too). Initially, it will not make money, may be WHO KNOWS without proper estimations. Start with digging towards Bahamas, Virgin Islands and Puerto Rico. May be 1-2 Centuries back, then Budding Oil Industry also might have attempted to kill the Coal Industry, Well established by that time! It hadn't stopped drilling for Crude Oil in Oceans and also IMPORTING from Abroad! What about the expense of Refining the Crude Oil?
" can you please provide proof of our own position that doesn't come from oil company think tanks? " "Before anyone posts something saying this is biased and will never work, can you please provide proof of our own position that doesn't come from oil company think tanks?" Simply calculate how much batteries it requires to provide 31% of the global energy demand, and compare it to how much batteries the world is producing today, and then think about how the industry will scale in 30 years to supply the difference. The second reason for infeasibility is political problems, because much of the crucial resources come from countries that are antagonistic towards the others, so they're more than happy to jack up the prices. These studies always assume that e.g. the Middle East is happy to just sit by and let Europeans buy up land and put solar panels and transmission lines everywhere to "buy" energy out of the region - of course they're going to use it as leverage to run their own geopolitical ends.